Yes, I had fun. Got that outta the way. I attended a scrapbooking day from 9:00 am to midnight on Saturday… and I lived to tell the story. One of the albums I worked on was the one we are supposed to send to Zaza when we accept her referral. It is to be an introduction of our family and home for her to familiarize herself with before we travel down to South America. So I’ve taken pictures of the house, the dog, Walmart, the kitchen table, our relatives that live here in Phx., the van, the boys playing hockey, Grandma and Grandpa’s house, the church, the bathroom, Taco Bell, …. all the regulars in our life. We hope to get this album back when we bring Zaza home so she will have a memory of the first time she saw all of us and our lives, but we don’t know if we will get it back. Needless to say, I did not throw my creative scrapbooking soul into this project. There are no ribbons, no eyelets, no buttons, no inked edges, no tearing, no staples, no silk flowers, etc. etc. It’s a back-to-the-basics album: paper, photos and journaling. I went through my paper stash and pulled out all the pastels that I hardly ever use. It is an 8×10 album and I covered each page first with pinks, yellows, pale blues and lavenders. It’s pretty. (sort of.) I tried to organize the photos so there was a sense of flow: us, house, yard, pets, relatives, other. (Yes, pets came before G&G and Aunts and Uncles.) I didn’t even back any of the photos. Yes, this was hard for me. The instructions were to leave room for someone to write the Spanish translation of my journaling, so I didn’t write much. I haven’t made an album this plain and simple for 12 years. Several ladies present were new acquaintances for me… and I to them. Lovely ladies and new friends. As usual I talked my way through the album and they were all fully aware of what I was working on. They asked to see it when I was done… yes, I finished the whole thing in about 3 hours… 30 pages. A new record. They were so gracious and told me how nice it was and that they liked the paper I chose. I know I won’t be in any frame of mind to do Zaza’s scrapbook, no matter how simple, once we get the referral call, so this was good. Real good. Well, the dying of the stinky wool came off without a hitch… well, except for the unexpected colors. 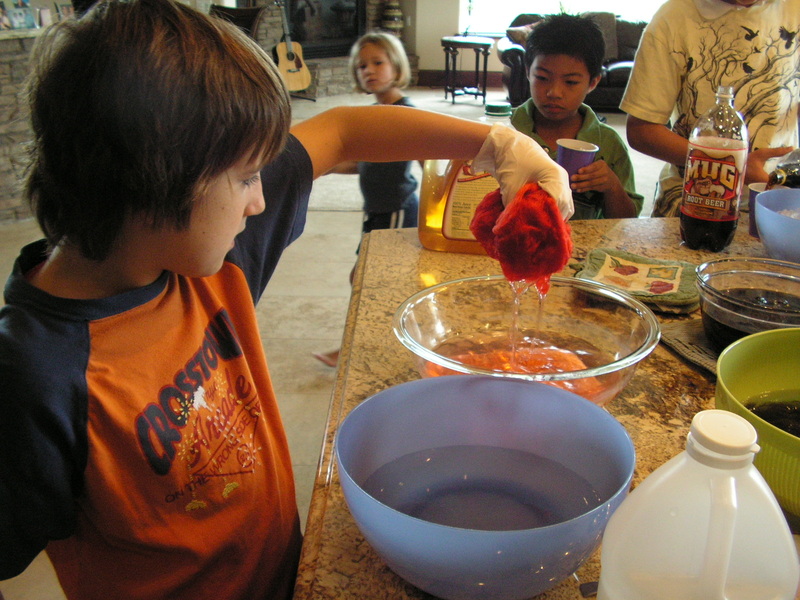 We did two natural dyes, bougainvillea and onion skin, in addition to purple and red Kool-Aid. 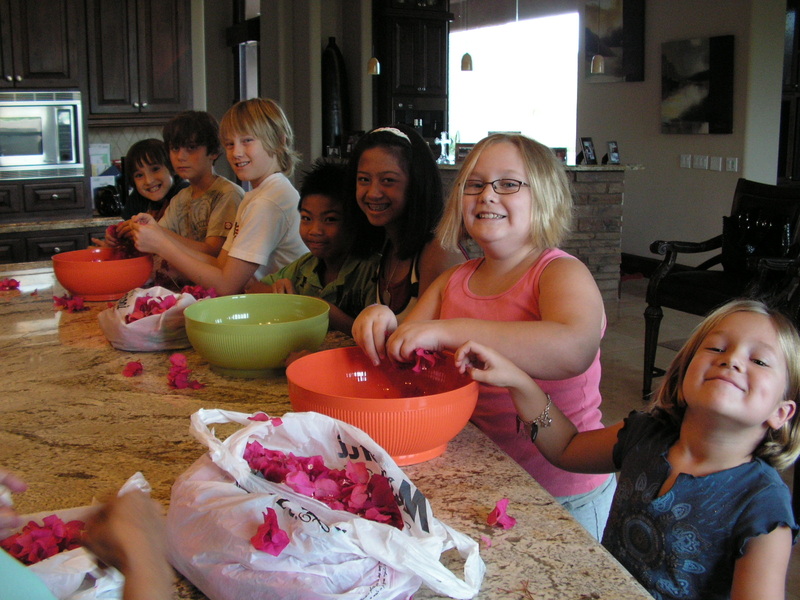 The kids all broke up the bougainvillea flowers and we boiled them for 30 minutes. 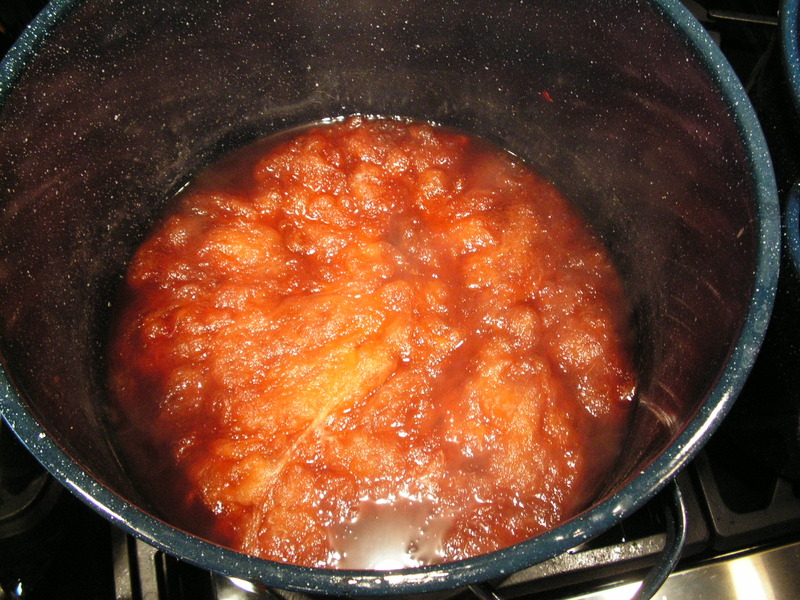 We strained out the flowers and simmered the wool for another 30 minutes. We did the same with the Walmart onion skins. The night before dying I went in and cleaned up the yellow onion bins for the nice produce people at Wally’s World. I gathered a whole bag of free skins! 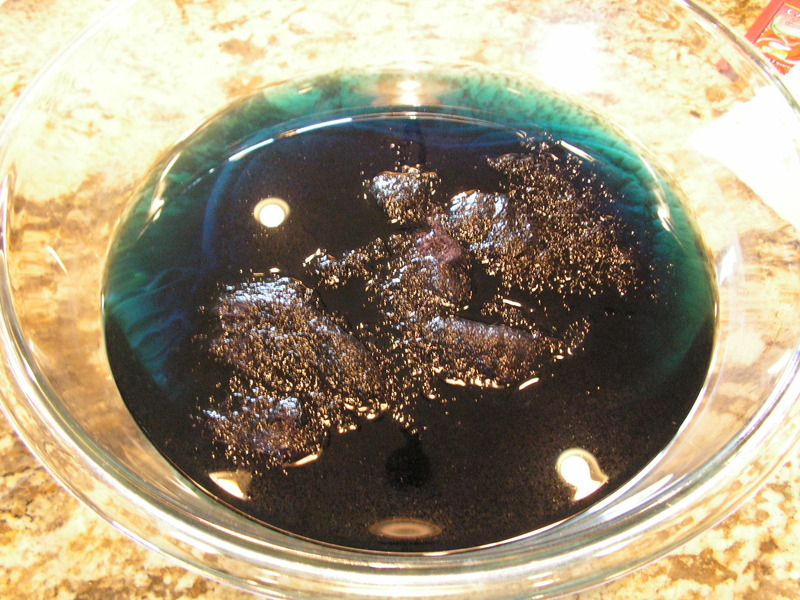 The Kool-Aid dyes we cooked in the microwave for 8 minutes with the wool and then let them cool to room temperature. Here are the masterpieces. Guess which one was the hot pink bougainvillea? The yellow onion skin? The purple Kool-Aid? and the red Kool-Aid? Ok, the Kool-Aids were easy. But the other two are the opposite of what you’re thinking. The pale yellow one is the hot pink flowers and the deeper brown one is the onion skin. So, why in the world did we do this? And what in the world did we learn? I figured out tonight that our wool is from a corriedale mixed sheep (whatever that is!). We learned that vinegar breaks down dye and makes it spread evenly. We discovered that pink flowers make pale yellow die…. go figure. The sheep and weaving unit is under the Godly character trait of Trust. Sheep really do have to trust the Shepherd, just as we trust our heavenly Shepherd. We also got this wool business out of our systems so as not to have to go through it again. Ever. Forever. Forever and eternity. 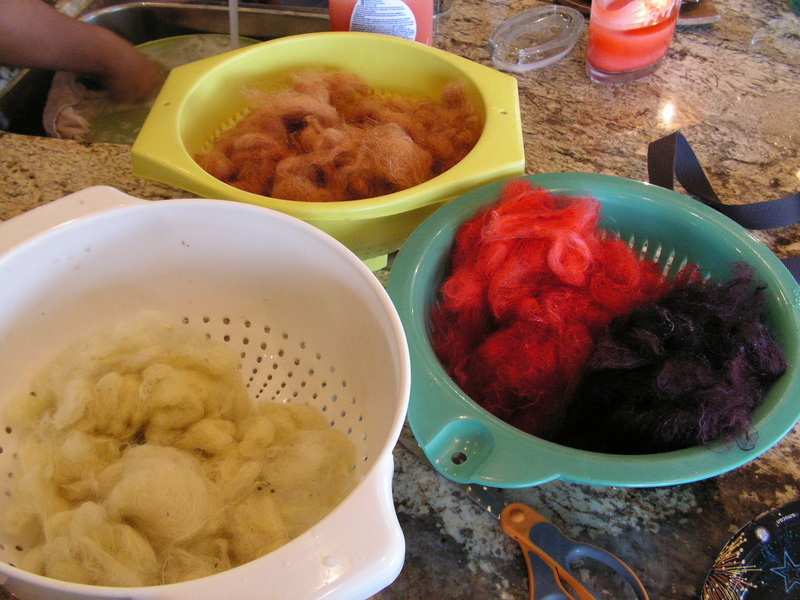 Actually, I’m addicted to pulling little balls of wool over my kitchen sink … it’s therapeutic. And I have about 50% of the smelly wool left to wash the pick. Yes, I’m considering it. Remember, people, I said THERAPEUTIC! And I fell in love with the brown dye from the onion and the passionate purple from the blue Kool-Aid. Sorry, Jennie. Now, to make a drop spindle and have at it.